By studying the genomes of more than 5,000 Samoans, researchers have uncovered a single gene that boosts a person’s obesity risk by upwards of 40 percent. Remarkably, this gene—which appears in a quarter of all Samoans—may have arisen in the population as they colonized the South Pacific. Working with colleagues from several universities, Stephen McGarvey from Brown University made the discovery while scanning the genomes of thousands of Samoans. This populations has some of the highest obesity rates in the world, a fact that prompted the scientists to conduct a genetic investigation. Around a quarter of all Samoans involved in the study had the genetic variant, which was associated with 30 to 40 percent increased odds of being obese compared to those who don’t have the gene. At the same time, this gene is virtually non-existent in European and African populations and occurs at very low frequencies among East Asians. “Although we have found a genetic variant with a reasonable biological mechanism, this genetic variant is just one part of the many reasons for the high levels of BMI and obesity among Samoans,” noted McGarvey in a press statement. Other factors include diet and physical activity. Indeed, the globe’s shift to calorie-rich processed foods and more sedentary lifestyles has contributed significantly to the elevated rates of obesity among Samoans. But as this new study points out, their genetics are also working against them. This gene appears to work by causing cells to store more fat and release less energy. As Alice Klein pointed out in New Scientist, it’s as “if [cells] are trying to conserve as much fuel as possible.” And indeed, there may be a very good reason why this gene appears at elevated levels among Samoans. It has to do with their history of colonizing the South Pacific Islands. 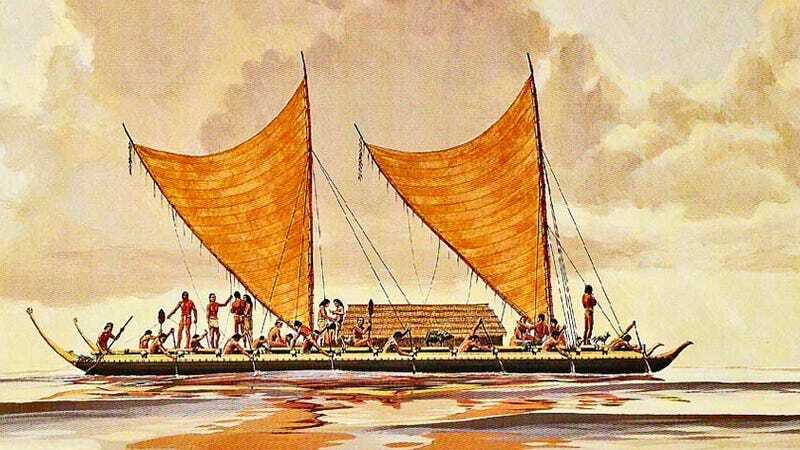 Starting around 3,500 years ago, ancestors of Samoans began the arduous task of settling the 24 major island groups of Polynesia. This colonization process—one of the most extreme examples in all of human history—took possibly thousands of years to complete. “They had to endure voyages between islands and subsequently survive on those islands,” study co-author Ryan Minster told New Scientist. As Darwin pointed out many years ago, evolution requires long timescales. But in some instances, when environmental conditions are particularly severe and attritional, selectional processes accelerate the process—an evolutionary phenomenon dubbed “punctuated equilibrium” by the late evolutionary biologist Stephen Jay Gould.